First off, don’t get too excited…this does not mean we are back to regular posting after a 3-year hiatus. Someday, perhaps, but not now. That said, the recipe we concocted Sunday night was so ridiculously delicious that it could not go unpromoted. And even more astounding is that nothing was looked up online, no ideas were culled from outside sources. This developed independently in my mind, and sure satisfied the ego along with our palates. Actually, “satisfied” is way too tame a term to describe the meal; “heaven on a plate” is more apt. It started with a delivery of fresh strawberries from the farm co-op we belong to. Then the idea of pairing them with jalapenos flowed through the brain, and a sauce was born. But on what shall this sauce reside, I wondered aloud to no one in particular. “Fish!” shouted a voice from the empty cavern of my skull. Ok, fish it is. And then I thought grilling the fish would be a fabulous idea. So at the grocery store, I perused the oceanic offerings and noticed something this market doesn’t usually carry: red snapper. Beautiful skin-on filets with that pink hue coursing throughout the fishy flesh. And it’s way easier to grill fish with skin than without because it doesn’t fall apart (plus that thin crispness is to die for). I’d never grilled fish with skin before, but this meal was taking shape in my mind and I had to follow through. So I put the sauce together, got the fish oiled up and seasoned, and I planned to serve it over rice (I should have also included asparagus or some other green vegetable, but I was too focused on the fish and sauce). I did grab a shallot and threw that on the grill as well, and man, am I glad I did. 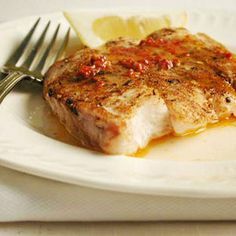 The sauce has a great balance of sweetness and spice, which really perk up the relatively bland fish, the rice soaks up that saucy goodness, and the shallot added an awesome bite of umami that tied everything together. All in all, I was in such awe of this dish that I felt compelled to return to the blog. Hopefully it’s a harbinger of more recipes to come. Enjoy! Heat a well-oiled grill to medium heat. Pat the fish dry with a paper towel, then thinly coat with olive oil and season with salt and pepper on both sides. When grill is ready, place fish skin-down directly on the grate. Cook about 8 minutes, checking for doneness by folding the filet from one end toward the other – when it flakes, it’s done (do not overcook!). While fish cooks, put strawberries, jalapeno, honey, lemon juice, salt and pepper into a food processor and blend until well combined. Heat in a saucepan over low heat until warm. Serve fish (and onions/shallot if using) over rice, then pour sauce evenly over everything. Eat!